I believe that pregnancy and children are a gift. There are so many people that aren't blessed with children and long for them. Because of this, I really have never taken advantage of the fact that I can bear children. 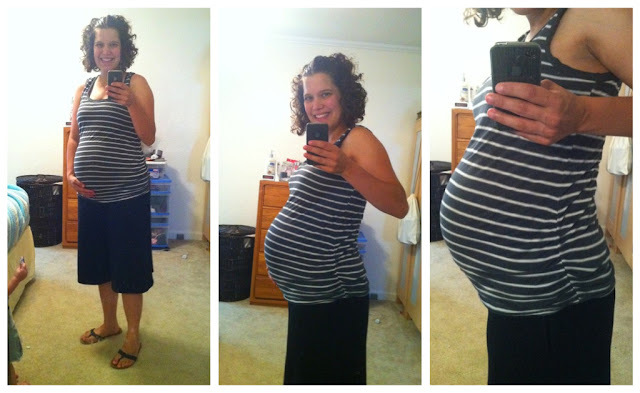 I don't like complaining about the downsides of pregnancy (well, except to Ian so I can get a back or foot rub out of it!) because all of it truly is a blessing. Being pregnant really is a miracle. Hearing that heartbeat for the first time, feeling those kicks and movements. All of it is truly amazing. But at the same time, none of it even compares to having that child in your arms. Playing with them on the floor. Raising them to be men and women of God. I am just so thankful for the blessings God has given to Ian and I in the form of children. I've determined that I need to take more pictures with the regular camera and less with my phone. They just come out better. And if I really want these memories to last a lifetime, they should be better quality. Speaking of pictures, I just booked my maternity photo session for in a couple weeks. I am really excited about that. I already can't wait to see how they turn out and to see pictures of us as a little family together. You look beautiful! That bottom spot especially is gorgeous. Good resolution to take pics with your camera, it's TOTALLY worth it. I get SOOO excited every time I see you did a new pregnancy fashion photo shoot. You have such a powerful beauty. These are beautiful photos and I cannot WAIT to see your actual sesh!